The use of social media by opposition groups and activists in Syria has allowed those of us who follow these sources carefully to pursue a different form of insight into conflict reporting than had been possible before the time when opposition fighters reflexively videotaped their operations and posted them online. With hundreds of videos showing the activities of fighting groups now posted on YouTube each day, external analysts have been allowed to build a picture of events in Syria that in past wars have gone unrecorded. These videos, often shared via Twitter and Facebook, allowed analysts and arms spotters in 2012 to track almost in real time the escalation in the conflict on both sides, including the use of cluster bombs and incendiary bombs, as well as potential war crimes committed by the government and the opposition alike. YouTube has also been instrumental in allowing analysts to follow certain arming trends, including the arrival of shoulder-fired heat-seeking missiles to rebel possession last year and the influx in 2013 of weapons previously unseen in the conflict. This in turn provides an opportunity for traditional investigation. In short, during the past several weeks scores of videos have been uploaded to YouTube that provide evidence of a seemingly distinct flow of new weapons to the country, which The New York Times has now identified as a Saudi-financed flow of arms from Croatia. I first noticed arms heretofore unseen in Syria when two videos taken from Syrian state television were uploaded to channels sympathetic with the government of President Bashar al-Assad, showing weapons seized from the Syrian opposition. The first video showed large quantities of weapons reportedly seized by government forces in Dara’a in southwest Syria, just north of the border with Jordan. It claimed to show Israeli-made weapons, four antiaircraft weapons and an antiaircraft cannon. The second video shows a smaller collection of weapons taken from a group of opposition fighters killed by the Syrian military in near Sad al Roum, Suwayda, near Dara’a. It is not unusual for Syrian state television to show collections of weapons taken from opposition fighters, but what is unusual are the weapons captured. In the first video we see four different weapons, and ammunition for those weapons. First, we have the M79 Osa. The M79 Osa is an antitank weapon originating from the former Yugoslavia. Rather unusually the rockets come in separate pods that are attached to the rear of the rocket launcher. Dozens were present in the first video, and two in the second. Markings visible on rocket pods in both videos indicate that they were manufactured between 1990 and 1991. We then have the M60 recoil-less gun, seen on the far left of the picture, below left, alongside dozens of M79 Osa rocket pods. Again, the M60 is a weapon originating in the former Yugoslavia and has continued to be used in Serbia, Croatia and Macedonia since Yugoslavia’s breakup. 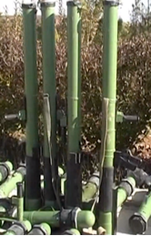 Also pictured, at right, are a large number of RPG-22s. RPG-22s are one-shot disposable antitank weapons, originating in the Soviet Union and used by a number of countries, including Croatia. Finally, there’s the RBG-6 grenade launcher. The RBG-6 is a reproduction of the South African Milkor MGL Mk-1 40-millimeter semiautomatic grenade launcher, made in Croatia. What is interesting about these weapons is none of them are used by the Syrian military, and, apart from small numbers of RPG-22s, none had been used before by the Syrian opposition. While Syrian state television could never be considered a reliable source of information, it seemed extremely unlikely that weapons had been shipped in from the former Yugoslavia for propaganda purposes, especially in the huge quantities shown in the first video, when ample weapons are available inside Syria for such purposes. Both videos purposed to show weapons captured by government forces in the Dara’a-Suwayda region. So I went back and examined the videos uploaded to YouTube by armed opposition groups in that region. All four of the weapons not only appear in a large number of videos from that region, but also appeared to play a significant role in one particular opposition offensive. At the start of January, a number of opposition groups operating in the Dara’a region joined together and attacked Syrian government forces in the town of Busr al Harir, nearly 16 miles northwest of the city of Dara’a. These combined forces, including the well-established Omari Brigade and other smaller groups, were all armed with the weapons pictured above. Opposition groups in this area, it seemed, appeared to have received a sizable quantity of weapons from sources outside Syria. In January, more than 60 videos were posted from groups fighting in this location showing the four different weapons, as well as videos showing multiple destroyed armored vehicles and heavy fighting. As I looked further, I found that this was not the only place where these new weapons had appeared. In the second half of January, videos began appearing showing the Ababil Horan Brigade, which had been operating in and around Damascus for several months, using the M60 recoil-less gun to attack Syrian forces inside Aqraba, in the southeast suburbs of Damascus. This was followed in February with videos of fighting in the southern Damascus suburb of Al Qadam showing the Ababil Horan Brigade with the RBG-6 grenade launcher and M79 Osa rocket launcher. On Feb. 8, another group fighting in Damascus, the Abdullah bin Masood Brigade, posted this video showing them fighting in the Yarmouk Camp area of Damascus, in which they state they had joined the Ababil Horan Brigade, and seems to demonstrate the growing power and influence these new weapons give to the groups that control them. Other groups in Damascus have now been seen with these weapons, including the Daraya Martyrs Brigade using a RBG-6 grenade launcher. 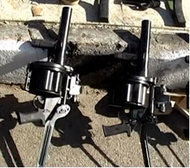 All across the region between Dara’a and Damascus, there were an increasing number of videos showing these weapons’ being used by a number of armed opposition groups. This video from Feb. 12 shows an M60 recoil-less gun operator being killed near Deir al Bakht, between Damascus and Dara’a, and this video shows a M60 recoil-less gun being used on the same day near El Sahoah, east of Dara’a. These videos document how widespread the use of Yugoslav weapons had become. A video posted on Feb. 13 shows a classroom of fighters, described as being from the Free Syrian Army, being taught how to use these new weapons by instructors from the Farouq Brigade, in a seminar organized by the Free Syrian Army’s Dara’a-based Dawn of Islam Brigade. The new weapons, it seemed, are being incorporated into the opposition’s training. By the time the weapons had spread beyond the fighting for Daraa and Damascus. 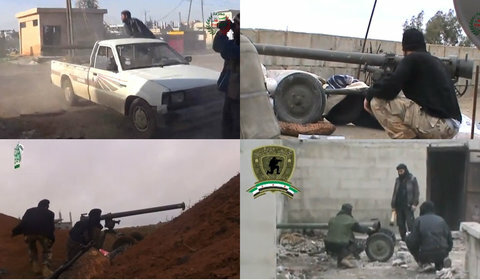 Videos from the Hama, Idlib and Aleppo regions have shown these weapons in use from late January onward. Two of the most interesting videos from Aleppo show a M79 Osa rocket launcher in the hands of Col. Abdul-Jabber Mohammed Aqidi, reportedly the former commander of the Free Syrian Army in Aleppo Province. Colonel Aqidi is now part of the recently formed Supreme Military Council, acting as one of six representatives for the Northern Front, and, maybe more telling, one of two members of the armament committee for the Northern Front, with these videos being one of a series from his recent visit to opposition forces in Aleppo. While videos of these weapons being used in the Aleppo region are still quite rare, their use in Hama and Idlib appear to have coincided with a number of major clashes in those regions. In this video from the recent clashes in Kernaz, Hama, we see a number of rocket launchers, including the RPG-22 and M79 Osa. In the major battle at Wadi Dief military base, just southwest of Maart al-Numan, Idlib (not far from the Hama provincial border), involving a large number of opposition fighters from various opposition groups, including Jihadists and the Free Syrian Army, photographs and videos from the area have shown the opposition using RPG-22s, M79 Osas, and at least one M60 recoil-less gun. There’s a number of interesting things about these weapons. First, it appears these weapons are only going to moderate groups with links to the Free Syrian Army, and not to Jihadist and Salafist groups such as Al Nusra Front, which the United States has designated as a terrorist organization. Second, the presence of the newly arrived Yugoslav weapons across the entire length of the country to the north suggests the possibility of two supply lines providing these weapons – one from Jordan and another perhaps from Turkey. Finally, these weapons offer a degree of control to those supplying them. The M79 Osa and M60 recoil-less gun both fire projectiles not common in the region, and the RPG-22 is a one-shot disposable weapon. This means that if the supplier cuts off ammunition supply the weapons become less menacing — an ideal circumstance for anyone who hopes to make limit their spread beyond Syria’s current war.